Serving up an amazing mix of international and New Zealand roots, soul, funk and blues this Easter! 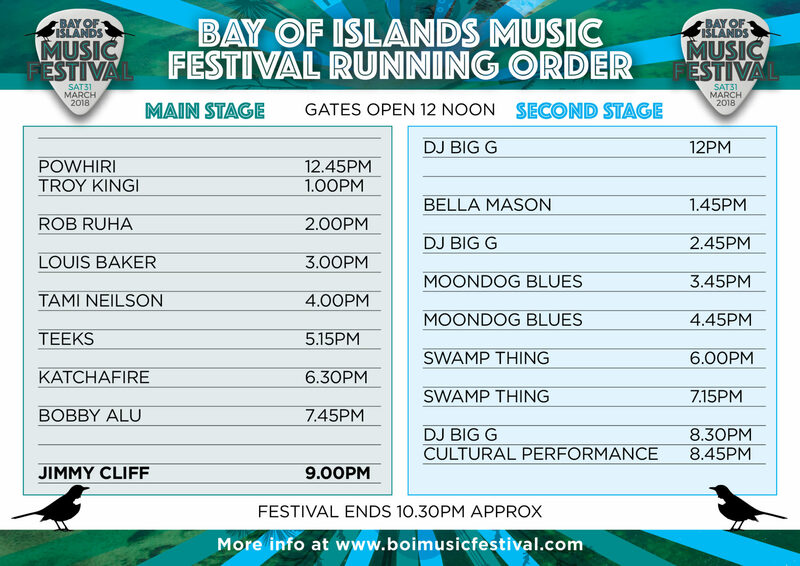 The BAY OF ISLAND MUSIC FESTIVAL has announced its incredible artist line-up which features roots superstar JIMMY CLIFF (JAMAICA), the Island-style rootsy soul of BOBBY ALU (AUSTRALIA) and the absolute cream of Aotearoa roots, blues, soul and funk including KATCHAFIRE, TEEKS, TAMI NEILSON, LOUIS BAKER, ROB RUHA, TROY KINGI and SWAMP THING. As well as the music, concert-goers will be able to enjoy local food, wines and beers, arts and cultural activities. Corporate and VIP Rooms are available and all have a balcony or deck over-looking the festival site with a premium view, private bathroom, reserved parking, express entry and delicious arrival platters. Rooms have capacities of 6 or 10 people and are extremely limited in number. Check out details of how to book a VIP Room here. Return buses will run from various points in the region. Click here for full details on transport and parking options. 12 year olds and under FREE (GA only). Must be with accompanying paying adult. Taking advantage of the hotel setting, one accommodation wing is transformed into a unique Festival VIP Zone. The VIP Rooms all have a balcony or deck over-looking the festival site, with a premium view of the stage and the sparkling water. These will be in hot demand and are limited in number. You can book your VIP Room via Eventfinda.co.nz or contact us now on boi.events@millenniumhotels.co.nz to discuss in more detail and reserve a space! Ticket Holders to display their VIP Wristband when exiting zone to be able to regain access without disruption. No Food & Beverage is to be brought in from outside the venue; all ticket holders will be subject to security check and will have prohibited items removed before entry. The easiest way to get to and from the festival is to get a return bus. Book your preferred departure time. Buses will commence return journeys from 11pm and depart as each bus fills. Great Sights have put on a late ferry departing the Waitangi Wharf to Russell at 10.45pm for Festival attendees. 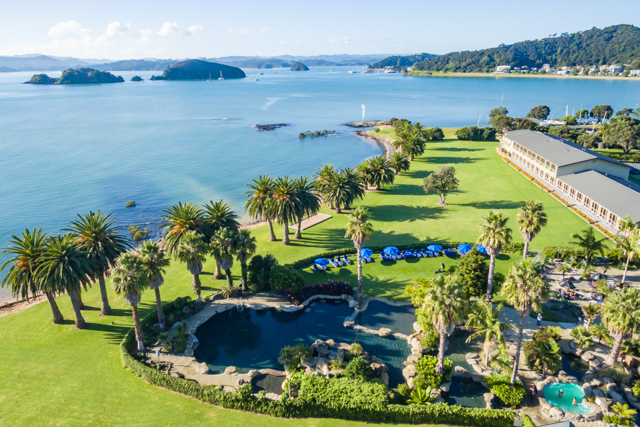 There is plenty of parking available opposite the Copthorne and Waitangi Treaty Grounds in the large Sports Field, Tau Henare Drive. Please be aware that there are only 2 ways to access this car park; via the Waitangi single lane bridge or via Haruru Falls Road (unsealed road for part of way). At certain times traffic will be heavy and the bridge will have traffic management and one-way systems in place to ease congestion.